I am an adopted southern woman. Having grown up in Colorado, it has been a beautiful adventure, not only falling more in love with my husband, but my new State of Alabama. It will be a year next month since moving to the Heart of Dixie. I can hardly believe it. Where does the time go!? As much as I love being creative and trying new things (thank you Pinterest! ), the timing for this endeavor may not have been the best. Haha. Needless to say, after several hours of sanding and painting in the sun, I was ready for a thirst quencher! A friend of ours, Ms. Esther, told us about using the rinds of a pineapple to make pineapple water (brilliant). What a savvy thing to do! Who wants to waste all that flavorful, liquid gold? 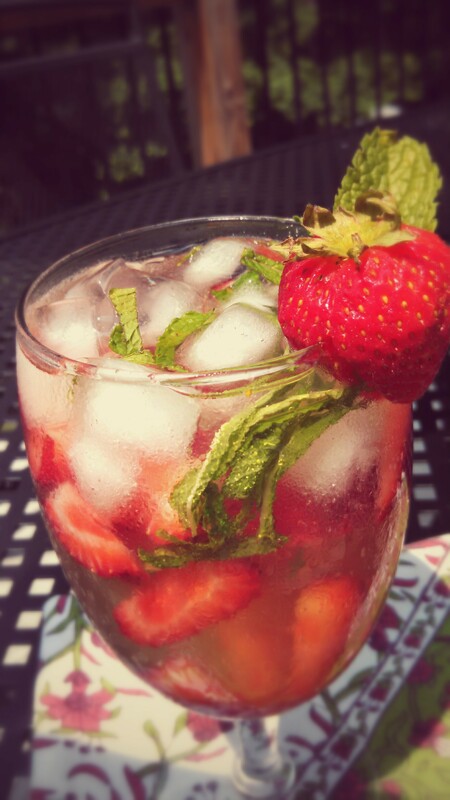 Well, this made a perfect base for today’s new concoction: a Pineapple Cooler with Strawberries & Mint. Wanna beat the heat? Give this little baby a try! Bring a pot of water to boil. Add pineapple rinds and boil for about twenty minutes. Store in the fridge until cold. Fill half a glass with ice. Top with sliced berries and honey. Pour pineapple water over the top. Cut fresh mint into glass and stir. Garnish with a whole strawberry and mint leaf. Note: You can mix everything together in one large pitcher if you prefer (great for parties!) I just made mine in a single glass today. This ensures lots of berries and mint for each one! If making in a pitcher, consider adding more berries and honey than recipe calls for.